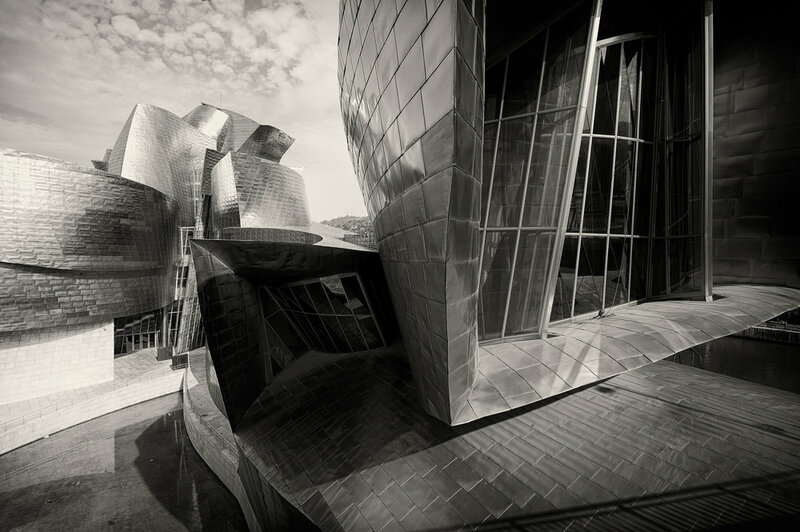 Visiting the Guggenheim had always been something of a mission. Having read numerous publications, it was clear that this iconic building was something different. But it isn't until you stand in front of this behemoth that you understand just how complicated the design is. 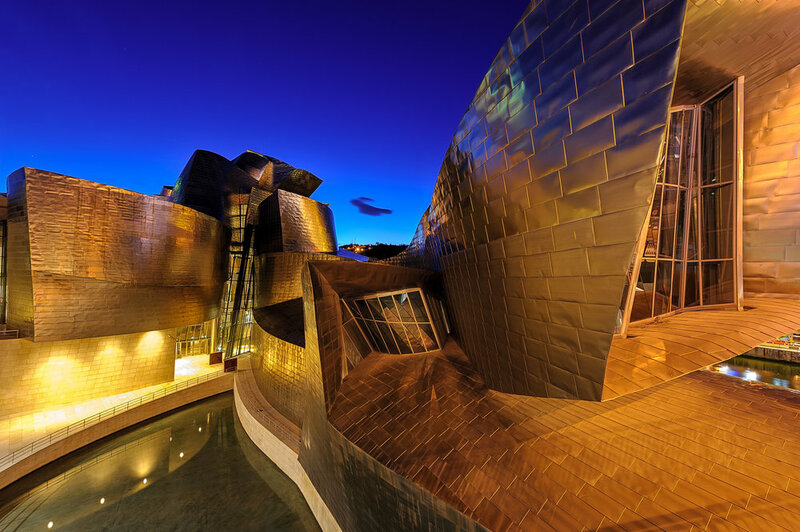 Wave-like curved walls, a reflective titanium skin which changes color according to the time of day and corners which seem forcefully bent out of shape, it was clear that no part of this building would be straightforward to photograph. It takes a while to understand that you are dealing with four distinct facades, each requiring a different approach. 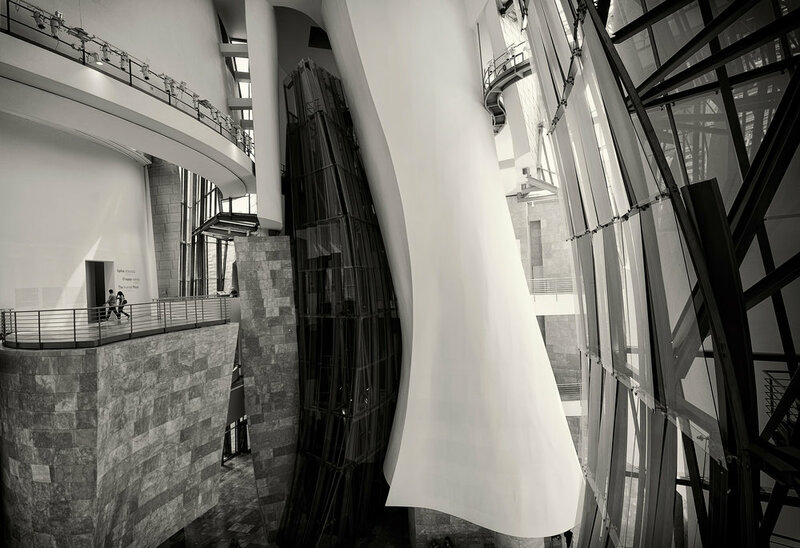 The south entrance greets visitors with an open-ended, avant-garde structure with a downward flowing staircase. The west facing side shows the more public areas (terraces, shopping, cafés) and is used to display exterior works of art by renowned artists. This side receives light during the afternoon and is the easiest to capture. 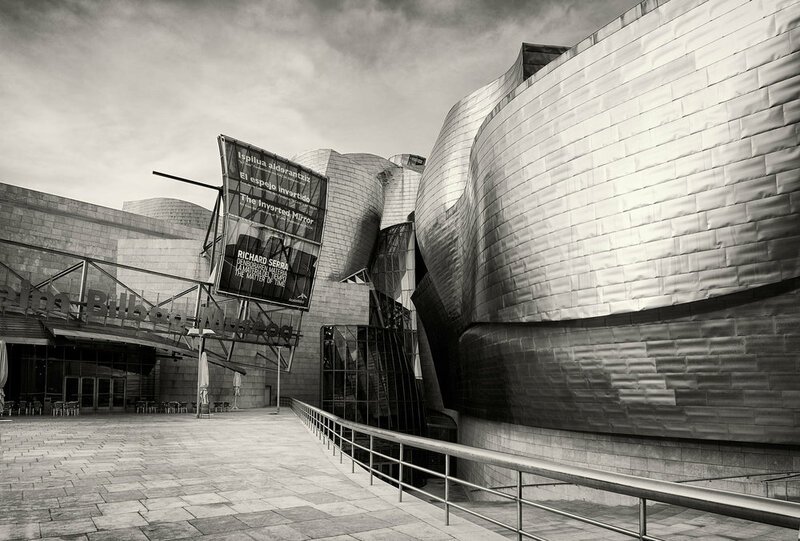 The South facing facade is the most popular angle and rightly so: it offers a complete view of the building from across the Nervión River in downtown Bilbao. Finally, the east side of the Guggenheim is the most peculiar. It bursts out of its own design with huge, oversized eccentric windows rendering a very aggressive look. Why does each side deserve a unique approach? Because each side seems to have its own persona. While the entrance flows outward in a warm, cordially inviting fashion, the south facade has a touch of romance with its calm riverside reflections. The east and west side are also complete opposites: one offers a playground and a rounded infrastructure, while the other sits beside a high-speed bridge which lights up with colors at night. The nocturnal rebel, if you will. Photographically this translates into hard contrasts for the east, diffused light for the west, and dusk & dawn for the north and south. This is why the Guggenheim requires at least 4 days to be shot correctly. The interiors are less complex, but still require some exploring. 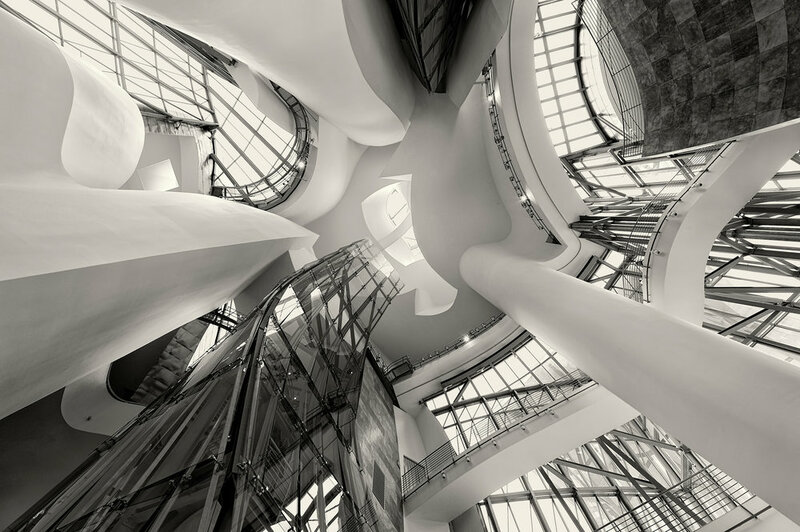 The curved walls, glass panels and metal girders flow upwards into the atrium, while twisting along the way to form the different exhibition rooms. The shadows these girders create can be used to emphasize the structure, and further empahsis can be added by eliminating color and processing the interiors in black & white. Theory4 would like to thank the Guggenheim staff for cooperating with the lighting requirements. Images on this set are Protected by Copyright.